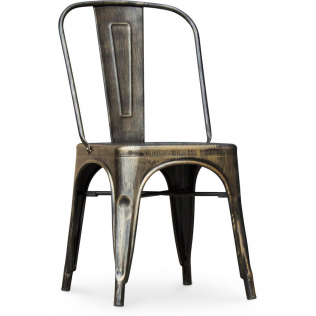 This Tolix chair has an industrial design in metal and wood, a flat seat and a tilted backrest for comfortable posture, making it perfect for use with a French cafe-style table. Just call for the waiter and sip your coffee as you watch the world go by! Discover the everyday charm of a cafe chair and note the small detail that really makes the difference in this rustic chair - the wooden seat. A warm and happy combination of natural materials and industrial design softens the appearance of this really charming chair that you can place in your kitchen, your living room or your restaurant. Today, does it again with this Tolix Chair Wooden seat Xavier Pauchard Style - Metal.We are helping to bring you design products that cannot be found elsewhere at cost prices directly from factories in Asia. Our team is always on the lookout for unique, top quality products and we are stepping up our efforts to bring you choice and quality at cost prices, products that will charm you with their design, their originality and their price!